TOKYO, May 12, 2017 - (JCN Newswire) - Fujitsu Limited today announced that the Fujitsu Group has established the "FUJITSU Climate and Energy Vision," a medium- to long-term environmental vision through 2050, with the goal of bringing the Fujitsu Group's CO2 emissions to zero, and achieving a decarbonized society, as well as contributing to the response to climate change, through technology supporting digital transformation. By achieving this vision, Fujitsu will create innovation through ICT that plays a role in leading the way to a decarbonized society. The Paris Agreement(1), an international framework for climate change countermeasures for 2020 and beyond, which came into effect in November 2016, established a goal of limiting the rise in global average temperatures to less than two degrees above the average temperature prior to the industrial revolution. In order to achieve this, a massive shift from low carbon to post carbon will be necessary. It is expected that regulations of CO2 emissions will be strengthened in the global market, and that carbon prices will rise sharply and carbon taxes will be introduced. In addition, investment taking into account Environmental, Social and Governance (ESG) factors, and a pullback in investment in fossil fuel industries, will continue, making changes in market rules increasingly apparent. 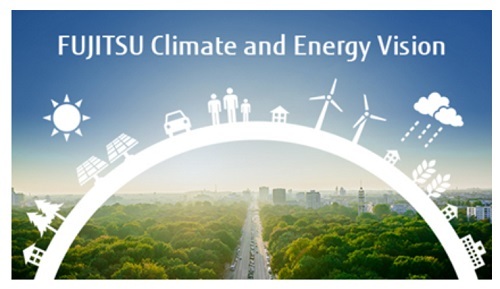 In light of this background, the Fujitsu Group established "FUJITSU Climate and Energy Vision," a medium- to long-term environmental vision through 2050 that clarifies the role it should play in climate change countermeasures, as well as how it sees itself in the future, as a global ICT company. Fujitsu's vision is to use ICT to accelerate its own efforts to shift away from carbon, to use the knowledge gained from such efforts in tandem with its digital technology to deliver solutions to customers and society, and to leverage its own business activities as a way to mitigate and respond to climate change. This vision is comprised of the following three axes. Fujitsu will greatly reduce its own CO2 emissions by developing and deploying cutting-edge technology, such as optimizing data center power consumption through AI control. At the same time, by strategically employing renewable energy and carbon credits(2), Fujitsu has set the goal for itself of zero CO2 emissions by 2050. Fujitsu seeks to contribute to a society that is moving away from carbon by working with customers in a variety of industries and business categories to shape their ecosystems, including with smart mobility and smart manufacturing. Fujitsu will help optimize the use of energy across whole social systems by digitally connecting a variety of things and services. For example, by analyzing and predicting positional data, weather information and traffic volume, in real time, to optimize automotive transportation. 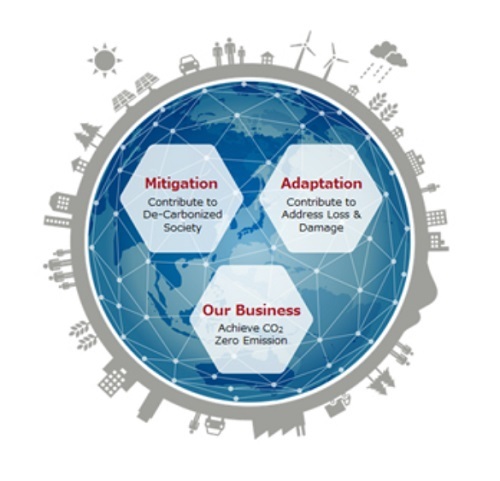 Fujitsu will help mitigate the loss and damage from climate change on customers and society by using technology that supports digital transformation, including sensing technology, simulations using high-performance computing, and advanced predictions of supply and demand using AI in solutions such as building resilient social infrastructure, or solutions that enable a stable supply of agricultural products and minimize food loss across the supply chain. A new framework for responses to global warming for 2020 and beyond, adopted at the 21st Conference of the Parties to the United Nations Framework Convention on Climate Change (COP21). Tradeable certificates of greenhouse gas reductions. The Japanese government cooperates with developing nations on initiatives to reduce greenhouse gasses, promoting bilateral offset credit mechanisms in which the results of the reduction are split between the two countries.